"People anticipated the next film I'd play Blair in would be about Iraq," says Michael Sheen, who reprises his role as the former prime minister in political drama The Special Relationship. It is the third time the Welshman has played Tony Blair in writer Peter Morgan's "trilogy" of films dramatising the Labour leader's career. He first stepped into the part in 2003 for The Deal, depicting the relationship between Mr Blair and Gordon Brown up until the 1994 Labour leadership election. Three years later he starred opposite Dame Helen Mirren in the Oscar-winning film The Queen as the PM advising the monarch following the death of Diana, Princess of Wales in 1997. This time, Morgan tells of the period 1994-2001, tracing Mr Blair's relationships with former US Presidents Bill Clinton (played by Dennis Quaid who ate hamburgers every day to put on weight for the role) and George W Bush. "We felt the story from Blair's point of view, and the more interesting story, was not during Iraq but the choices he made about Iraq - and that's the story about him and Clinton, or more specifically him and America," says Sheen, who was Emmy-nominated for the role. The film examines the "special relationship" between the US and the UK - a phrase first used in 1946 by Sir Winston Churchill to describe the close political, diplomatic, cultural and historical relations between the two nations. After Labour's 1997 election win, the story focuses on the relationship between Mr Blair and Mr Clinton as they deal with the Northern Ireland peace process, the Monica Lewinsky scandal and the war in Kosovo. "It starts with the first time Blair went to America to meet the Clinton administration as a junior politician and they give him advice," explains Sheen. "Clinton was able to inspire Blair into thinking this was the moment they could change things, where the old Special Relationship thing could actually have a big effect and they could make a difference. "It follows how Blair starts to understand the relationship and how he can use that to work for him - and we see during Kosovo that relationship really shifts and changes. "The film ends with the actual film footage of the first press conference between Blair and Bush. You get more of a sense of all the different things flowing around Blair and why he may have gone into that relationship with Bush in the way that he did. "In a way it is the Iraq film, just not the one that people expected," he says. However Mr Blair's former spin doctor Alastair Campbell - depicted on-screen by Mark Bazeley - has criticised the film's accuracy. Writing in the Radio Times, he said "the makers simply decided facts would not be allowed to get in the way of a good story", adding the Clinton/Blair relationship "gets nowhere near the truth". But Sheen defends Morgan's script saying: "Peter will say the writer reserves the right to stretch his writing muscle when doing this sort of stuff." He also dismisses the suggestion that Morgan created a "Blair-redeemed" character for this film, compared to the previous two outings. "None of the films have been about trying to promote a positive or negative image," he says. "I don't think Peter was trying to make it seem like he was always trying to do things for good. "It's interesting that people see what they want to see as far as Blair is concerned. I'm most interested in the ambiguity of him and that it's difficult to know whether what he's doing is motivated by purely noble ideals, or by opportunism and ambition." After two turns as Blair, Sheen says for this film he tried to consciously tone down his characterisation. I'll never say never, but I think three is enough. "When I look at The Deal now I think 'calm down it's too much', but that was the first time I did it. In the Queen I was a bit more relaxed, but this one I'm most pleased with because it doesn't feel forced or relaxed," he says. However Sheen admits he did find it helpful getting into character after meeting the man himself while at a dinner at media mogul Rupert Murdoch's house in Los Angeles which he describes as "extraordinary". "I just kept going to smell him and saying 'ah I see, that's how you walk through a door'," he says. "He knew about this film and said: 'I hope you're not going to make it look like Bill had all the fun.'" But Mr Blair has not offered Sheen any critique on his portrayal of him. "He said he hadn't seen the films which I can understand, because if he says he's seen them everyone asks him about it, but he clearly had a pretty good working knowledge of each one. "So he's now using my performance to answer questions about his own life!" After a trilogy of films playing Mr Blair, would Sheen consider a fourth? "I don't think so. I'll never say never, but I think three is enough." 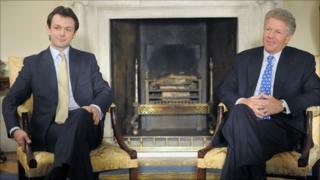 The Special Relationship is on BBC Two on 18 September at 2130BST.